From left to right: Judge at C Adrienne Pot, Roxanne Trunnell, Kate Shoemaker, Deborah Stanitski, Rebecca Hart, and Rowan O’Riley of Fair Sky Farm. Photo ©SusanJStickle.com. 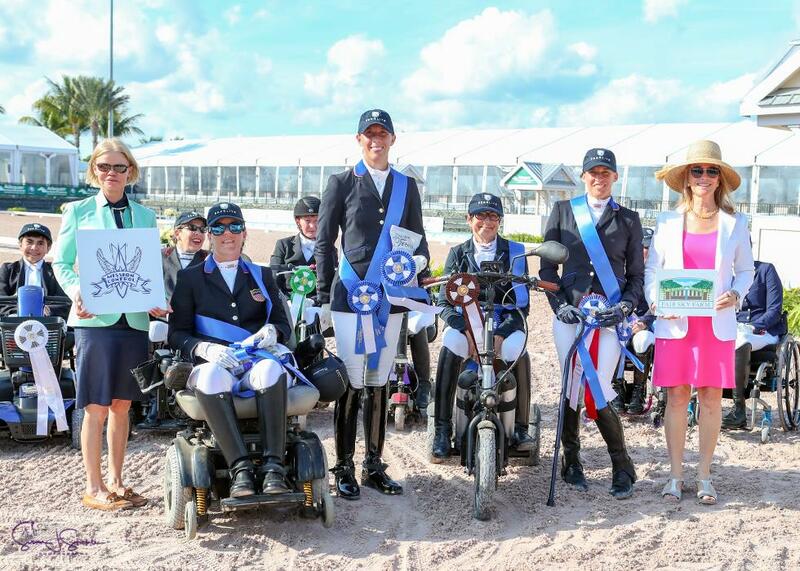 Wellington, Fla. – The U.S. Para-Equestrian Dressage Team had a strong showing at the 2019 Adequan® Global Dressage Festival (AGDF) in Wellington, Fla. on January 18-19. The team consisted of Rebecca Hart (Wellington, Fla.), Kate Shoemaker (Peoria, Ariz.), Deborah Stanitski (Charleston, S.C.)., and Roxanne Trunnell (Wellington, Fla.). The team competed in two tests – the FEI Team Test on Friday and the FEI Individual Test on Saturday – which each counted 50% toward the overall team score. The U.S. Para-Equestrian Dressage Team had a total score of 434.312%. Michel Assouline, USEF Para-Equestrian Dressage Technical Advisor and Head of Coach Development, was on hand this week to lead the U.S. Para-Dressage Team. Leading the team was Shoemaker and her own Solitaer 40, a 11-year-old Hanoverian stallion. In Friday’s Grade IV Team Test they scored a personal best of 74.208%. Another personal best came in Saturday’s Grade IV Individual Test with a 73.252%. Both tests were also the high scores of the day. Kate Shoemaker and Solitaer 40 won the Grade IV Team and Individual tests at the AGDF 2 CPEDI 3*. Photo ©SusanJStickle.com. Shoemaker was very pleased with not only her performance but how the team came together for their success. Another rider with a personal best on Friday was Shoemaker’s FEI WEG Tryon 2018 teammate, Rebecca Hart, on El Corona Texel, Rowan O’Reilly’s nine-year-old Dutch Warmblood gelding. They won both the Grade III Team Test on 72.794% and Saturday’s Grade III Individual Test with a 69.088%. The third U.S. teammate from the FEI WEG Tryon 2018, Roxanne Trunnell, piloted Dolton, Kate Shoemaker’s six-year-old Hanoverian gelding, to wins in Friday’s Grade I Team Test with a score of 73.690% and Saturday’s Grade I Individual Test on a 73.115%. Trunnell felt that her first outing in 2019 with her WEG partner Dolton was strong. Riding on her first-ever U.S. team, Stanitski rode Skovlunds De Nice, her 12-year-old Danish Warmblood mare, to scores of 65.238% in the Grade I Team Test and 64.286% in the Grade I Individual Test. 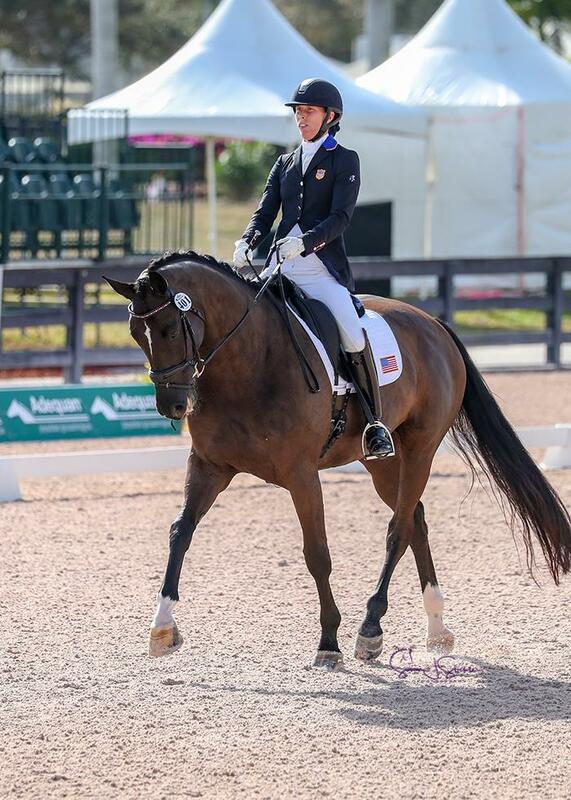 Along with the team riders, the U.S. fielded another nine riders at the competition, showing a strong presence of para-dressage riders in international competition. Riders will return to the ring for the final day of competition and their individual FEI Freestyle tests at the AGDF on Sunday. View the schedule, day sheets, prize list, and results. Stay up to date with U.S. Para-Equestrian Dressage by following USA Para Dressage on Facebook and US Equestrian on Twitter and Instagram. Use #USAParaDressage.